Quicksilver H2 Elite is an extremely easy-to-use breakthrough dietary supplement, whose main ingredients are magnesium malate and patented quantitative composition containing dextrose, malic acid, tartaric acid, L-leucine, microcrystalline cellulose and sodium stearyl fumarate. Tablets reacting with water or other non-carbonated drinks release a lot of tiny molecular hydrogen vesicles that saturate the liquid. Molecular hydrogen is one of the most effective antioxidants available that neutralize free oxygen radicals at the cellular level. Free oxygen radicals arise as a result of natural metabolic processes occurring in the body and as a side product of oxygen breathing, inflammatory processes or detoxification of the body. The increase in their excessive formation is also influenced by external factors, such as poor diet, smoking tobacco, alcohol consumption, intense breathing rate during physical exertion, industrial and environmental pollution, or ionizing radiation. Oxidative compounds have a negative impact on the entire human body because they lead to damage or malfunction of the cells and, consequently, even their death. At the moment of a significant increase in their activity, dysfunctions of normal antioxidant mechanisms or an insufficient intake of antioxidants with food, oxidative stress appears. This phenomenon is part of the etiology of many diseases, including of cardiovascular system, eyes, lungs, hepatitis, pancreatitis, diabetes, degenerative diseases of the nervous system. The consequences of the increased impact of oxidative stress on the human body are: oxidation of cell membranes, change in the structure and function of proteins, DNA damage, and consequently the formation of mutations and an increased risk of developing cancer. In addition, oxygen free radicals accelerate the rate of the body’s aging. In order to protect against these changes, the use of antioxidants has become commonplace. Antioxidants are substances that limit the degree of oxidation of molecules and allow the conversion of reactive radicals into inactive derivatives. 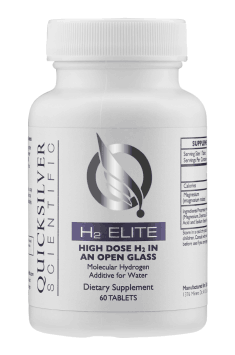 Quicksilver H2 Elite is a breakthrough dietary supplement, which through the generation of molecular hydrogen, one of the most effective antioxidants available, helps to protect the body against free radicals. It is believed that most antioxidants supplied externally in a form of food or dietary supplements are too sensitive to fully endure the digestive process and to reach the bloodstream in their active form to perform useful functions. Health experts see high resistance and antioxidant effectiveness in molecular hydrogen. Molecular hydrogen (H2) is formed as a result of a natural reaction of magnesium with water and is a unique molecule suppressing free oxygen radicals. It is mild so it does not interfere with the normal processes taking place in the body. H2 selectively eliminates only one type of free radicals, namely the most harmful and reactive - hydroxyl radicals. The use of molecular hydrogen does not involve any side effects, because the by-product in the process of neutralizing free radicals is water. In contrast to traditional antioxidants, H2 diffuses much faster to tissues, cells, mitochondria and body fluids and it is able to overcome the blood-brain barrier. Hydrogen molecules are that small that they easily get inside the cells, where they inhibit the action of free radicals. These areas of the body are very difficult for treating pharmacologically, while they are also the main spots for the formation of free radicals and DNA damage. Molecular hydrogen has many beneficial properties, mainly antioxidant, anti-inflammatory, cytoprotective and antiapoptotic. Scientific research has shown that drinking hydrogen water counteracts neurological degeneration by reducing the rate of loss of dopaminergic neurons and by reducing the overlapping of DNA damage and lipid peroxidation. Atherosclerosis and the cardiovascular diseases related are the results of chronically ongoing inflammation and oxidative stress, characterized by the condensation of inflammatory cells and oxidative products in the blood cells affected. Due to the property limiting the harmful effects of oxidative stress, oral administration of water supplemented with hydrogen prevented the development of atherosclerosis in the mouse model. In summary, Quicksilver H2 Elite is a dietary supplement with a broad pro-health effect. The product, after mixing with a non-carbonated liquid, provides the body with molecular hydrogen which is a much more effective agent than the traditional supplements to fight oxidative stress and destructive action of free oxygen radicals. Drop one tablet in a cup of pure water (12-16 oz) and wait for tablet to dissolve. Stir if necessary, drink immediately, repeat up to 3 times daily. For best results, the ready-made mixture should be drunk immediately. It is suggested to use it on an empty stomach and repeat up to four times a day, at regular intervals and according to individual needs. Molecular hydrogen therapy is completely safe because there is no upper dose limit, and the more hydrogen- saturated water drunk, the better for the body. Microcrystalline cellulose contains large amounts of fibre, allowing the gelling and thickening, making it useful as a filler (i.e. for medicines), capsules or powders. Also used as a filler in liquid concentrates supporting the athletes diet.